Warplanes on Saturday struck the Syrian town where a chemical attack had killed scores of people earlier this week, as Turkey warned that a retaliatory U.S. missile strike on a Syrian air base would only be “cosmetic” if greater efforts are not made to remove President Bashar Assad from power. The airstrikes on the opposition-held northern town of Khan Sheikhoun, where 87 people were killed in the chemical attack earlier this week, killed a woman and wounded her son, according to the Britain-based Syrian Observatory for Human Rights and the Local Coordination Committees, an activist collective. Elsewhere in Syria, U.S.-led airstrikes killed at least 21 people, including a woman and her six children who were fleeing on a boat across the Euphrates River near the Islamic State group’s self-styled capital, Raqqa, the target of a major offensive by U.S.-backed and Kurdish-led Syrian forces, activists said. 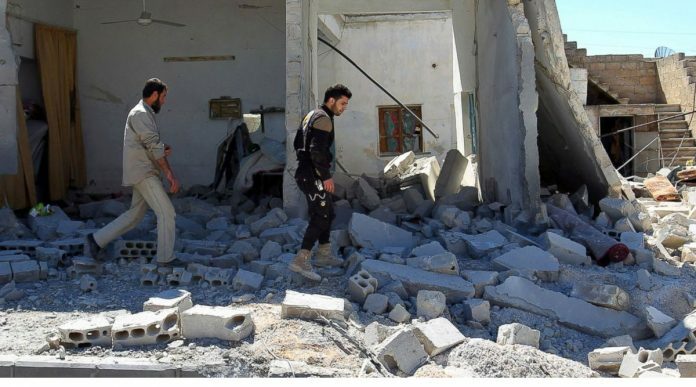 An airstrike on a rebel-held town in the northern Idlib province killed at least 18 people, including women and children, according to the Observatory and Ariha Today, an activist group. It was not immediately clear who carried out the strike. Near the central city of Homs, a bomb exploded aboard a bus carrying workers, killing a woman and wounding more than 20, according to state TV and the Observatory. The chemical attack prompted the U.S. to launch nearly 60 Tomahawk missiles on a Syrian air base early Friday, which killed nine people and marked the first time Washington has directly targeted Syrian government forces since the war began in 2011. The move was welcomed by the Syrian opposition and its main backers, including Turkey and Saudi Arabia, but harshly condemned by Russia and Iran, who back Assad and said striking his forces would complicate the struggle against extremist groups. Turkish Foreign Minister Mevlut Cavusoglu said the U.S. strike should be the start of a renewed effort to end the civil war, which has killed an estimated 400,000 people and displaced half of Syria’s population. “If this intervention is limited only to an air base, if it does not continue and if we don’t remove the regime from heading Syria, then this would remain a cosmetic intervention,” he said. Syria’s government has denied carrying out any chemical attack, and Russia’s Defense Ministry said the toxic agents were released when a Syrian airstrike hit a rebel chemical weapons arsenal and munitions factory. British Foreign Secretary Boris Johnson canceled a planned trip to Russia because of fast-moving events in Syria. Johnson said the situation in Syria has changed “fundamentally” following the chemical attack and the U.S. response. He had planned to travel to Russia Monday on a trip intended to start a fresh dialogue with Moscow. In a separate development, activists opposed to the Islamic State group said a U.S.-led coalition airstrike hit a boat carrying civilians fleeing across the Euphrates River. The groups Raqqa is Being Slaughtered Silently and Sound and Picture said the attack killed a woman and her six children. The attack occurred in the Shuaib al-Zeker area, near where U.S.-backed Syrian fighters have been battling IS under the cover of coalition airstrikes. Activists and state media said a separate airstrike by the U.S.-led coalition on the northern IS-held village of Hneida killed at least 14 civilians, including children. The Observatory said 15 people, including four children, were killed in the airstrike. The Sound and Picture group said the airstrike hit an internet cafe, killing 14 people. The kingdom is among the most vehement opponents of Assad and supports Sunni rebel groups fighting to oust him. The Sunni rulers of Saudi Arabia are in a power struggle for regional dominance with Iran’s Shiite government. Warplane Strike Syrian Town Hit by Chemical Attack. The airstrikes was on the opposition-held northern town of Khan Sheikhoun, where 87 people were killed.